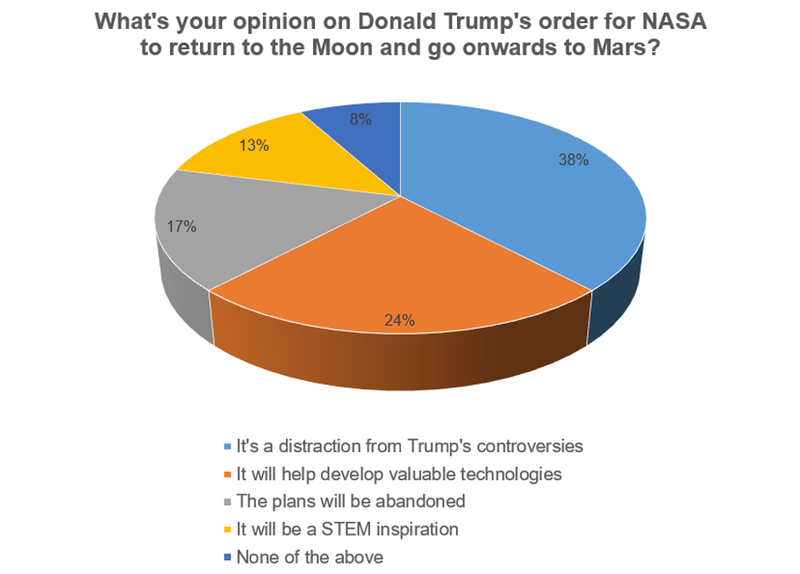 In last week’s poll we turned our attention to US President Donald Trump’s instruction to NASA to focus on a new crewed lunar landing programme and to develop a future mission to Mars. As we reported – unlike President Kennedy’s famous speech at the height of the Space Race in 1961 – Trump’s order is relatively vague and is in line with NASA’s existing plans to develop the Orion capsule, the giant Space Launch System rocket, and an orbital Deep Space Gateway. Neither is it the first presidential order directing NASA to the moon; both Presidents Bush issued Space Vision directives calling for missions to the Moon and Mars, but such programmes are such long term goals that the clock ran down with no such missions going ahead. We asked whether readers thought the plans would rekindle the glory-days of the space-race and drive technology development, or whether they were more cynical about Trump’s motives, and viewed the announcements as an effort to distract attention from the many controversies dogging his administration. Reaction from the 644 respondents taking part was fairly mixed, although the majority (55 per cent) were sceptical about the plans, with 38 percent of the overall sample feeling that Trump’s plans are an attempt at distraction, and 17 per cent saying that the plans will never come to fruition. 37 percent of respondents were more positive, with 24 per cent of the overall sample agreeing that Trump’s plans will help drive technology development, and 13 per cent expecting the move to act as a STEM inspiration. 8 per cent of respondents chose “None of the above”. Reader comments were generally in tune with the breakdown of the vote, with many expressing extreme scepticism over the president’s plans. “He’s just providing a temporary distraction from his disastrous premiership,” said Michael Reid. Others, like Chris, whilst still agreeing it was a distraction, were supportive of the proposed goal. “This may turn out to be the only good thing DT will do,” he said. There is no doubt that it is a distraction, but I think it would take much more that this to hide his incompetence in office. Hence I voted for ‘it will help develop valuable technologies’. If the human race is to explore our closest neighbours then it would make sense to have a staging post on the moon. this may turn out to be the only good thing DT will do. It would be great to herald this as the next great leap, heralding an inspiring and technology accelerating future but he’s just providing a temporary distraction from his disasterous premiership. Everyone is watching the clock of the remainder of his period in office count down impatiently. I’m not usually this cynical but prepared to make an exception in this case. I suspect it’s about keeping up with the Chinese and Helium 3 were the truth known. I recall when George Bush (the 2nd) launched a bold initiative to return NASA to the moon. He did this at the end of his first term – about 2004. NASA got about designing a new approach to the moon – Apollo on Steroids. However, Obama pretty much cancelled that, and focused NASA on Mars, but only slowly. So slowly, that frankly NASA is being bypassed by SpaceX. So I expect the next American President to change the direction. The Senate will still be debating the performance characteristics of the rocket (yes, the Space Launch System is nicknamed the Senate Launch System) when SpaceX astronauts are walking around Mars. Money. That’s the reason. Its a great big lump of exploitable resource….. In my opinion the Engineer should not follow the national press pass-time of Trump-beating. I hold no great regard for him, but he is the president of the USA and deserves both respect and proper criticism of course. We aren’t Trump-beating here, but it can’t be denied that with the continuing Mueller investigation and his difficulty in passing any legislation, he has plenty of controversy he’d probably like people to ignore. This is a good instruction and returns NASA to its core competences. We should never have stopped the moon project. The benefits to the scientific community from having a permanent manned base on the moon are huge. Hopefully, we as a collective effort from Earth will get back on track after this ridiculous 40+year hiatus. Trips to the moon are more doable, a trip to mars is a suicide mission sort of. If the effects of weightlessness do not take their toll, the radiation certainly will. We on Earth do not realise what a gift of life we have here and abuse it each and every day. The satelite climate monitoring is an excellent point. NASA’s excellent work in this area is showing incontrovertible proof of man-made climate change that cannot be comfortable for a climate change denying president. I suspect another motive will be a bit of small print somewhere that removes funding for the climate monitoring satelite programme. Trump did in fact, propose to defund NASA’s climate monitoring work last year, before his inauguration, but Congress refused to ratify his proposals. Forget the conspiracy theory, that is a distraction in itself. Donald Trump has made a perfectly logical order to develop space technology in places where we might gain some useful results, as opposed to racing to Mars. Such a race is for dreamers who choose to run before being able to walk. Such missions are galvanising and awe inspiring, go for it, the technological offshoots will be immense and the money is being spent anyway! I remember the first moon landing when it was broadcast on the radio and all work stopped and everybody gathered around to listen. Of course it’s risky and people will die but they will have lived, experienced and seen things that we can only dream about. I’d love to go to Mars! Would love to see any of this ‘incontrovertible proof of man-made climate change’ that doesn’t go against the basic laws of thermodynamics, chemistry & re-radiative gasses. NASAs climate monitoring satellites in the last ~40yrs, have given us the only truly global observational data & that, coupled with data from the Argo system, indicates a constantly changing but ultimately stable system, that we have little influence on & no control over … however important we think we are. Any prolonged human exposure to the Sun’s radiation creates massive problems because of effects on human genetic material. Without the protection of the Earth’s magnetic field, we will require significant research to be conducted on shielding or genetic repair. One option may be in the “field’ of generating a powerful super cooled artificial magnetic field, to surround the space craft. This will also require research into the effects of such a powerful magnetic field, long term, on living organisms. Research into DNA repair (CRISPR) whilst benefiting survival of man during prolonged space exploration has the potential to have spin offs into medicine, particularly Alzheimer Disease, reversal of degeneration of genetic material as a cause of aging and the genetics of cancer treatment. A robot can do space exploration far more efficiently and is much more cost effective but will not stimulate research with such immediate potential medical benefits to mankind. Every political “funded” change of direction potentially generates new avenues of research and is to be applauded. The main reason NASA stopped after Apollo & the space shuttles was cost. The only way we will get further into space is via an international agreement for everyone to work together. Private ventures will do it more for profit than science & our ability to expand the human race to other parts of the galaxy! We need to follow in the footsteps of people like Arthur C. Clarke & Carl Sagan. I am reminded of a comment about ‘climbing petunias’ -because they are there.